* If you prefer, you can see a .pdf version here (1.32 Mb). Greetings from Japan. We hope that this newsletter finds you well and gearing up for a wonderful summer. As for our summer plans, in a few short weeks we will be returning to the States for nine weeks of Home Ministry. We hope to connect with many of you during that time, but until then, here is a quick update on what the Lord is doing in our neck of the woods. The church is fast approaching it’s one year anniversary since transitioning to a simple-style house church. In many ways we are still learning how to actually function as the Body of Christ when we gather together, but gradually the Lord is renewing our minds and changing our culture. Specifically, we are beginning to sense the need to really discover what it means to live as a fully devoted disciple of Jesus. In the past, we have expected non-Christians to come to our church meetings in order to hear about Jesus, but now we are seeing that Jesus actually has a different plan. Rather than expect the world to come to us, He tells us to “go” into the world. As his disciples, Jesus wants us to reflect His character and reveal His Kingdom in whatever situation He has placed us. With this in mind, the church has set its sights on becoming genuine disciples of Jesus so that we can take the Good News of Christ to a broken, hurting world. PLEASE PRAY for the Oasis Church family as we desire to grow in the area of discipleship. This is new territory for many of us, and it is often tempting to slip back into old ways of doing the Christian life. PLEASE also PRAY for faith and boldness to put into practice the things that we are learning so that we might truly impact Japan for the Kingdom of God. In our last letter we asked you to pray for Mr. K. He continues to have a very open heart, but has yet to commit to following Jesus. PLEASE continue to PRAY for his salvation. Finally, we especially ask that you PLEASE PRAY for the church while we are absent this summer. May this be a wonderful time of growth for the church family as they learn to depend on Jesus to lead them and guide them during these summer months. 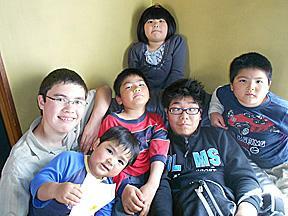 With the approach of June, the school year at Kansai Christian School (KCS) is quickly coming to a close. Chris has enjoyed her first year as homeroom/bible teacher for the 5-6th grade, but it proved to be a lot more time consuming than she had expected. That said, she has renewed her contract for the new school year starting in the Fall. Michael will finish up his fourth year of serving as KCS school chaplain, and has opted not to do it again next year. He has not ruled out doing it again in the future, but feels that he needs to focus his time and energy on providing leadership at Oasis Church and also improving his Japanese language skills. As for Luke, he will be graduating from 6th grade in June and will then make the transition to junior high school in the Fall. Since KCS serves grades 1 through 12, Luke will not be changing schools, but he is looking forward to finally being one of the “older” kids. Finally, KCS will be going through some major staff changes in September. Four of the seven full-time teachers (including the school principal) will be returning to their home countries after graduation in June. 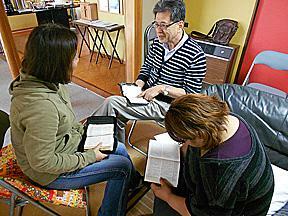 New teachers have already been found and will be arriving in Japan this summer. PLEASE PRAY for a smooth transition next school year. 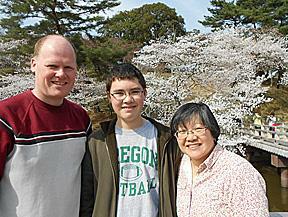 May all of the new staff quickly adjust to life at KCS as well as their new life in Japan. In late June we will be flying to the States for nine weeks of Home Ministry. It has been three years since we were last Stateside and five years since we have visited some of our supporting churches, so we are looking forward to connecting with as many churches and supporters as possible. Below is our schedule of the various churches where we will be visiting. We thank God for the opportunity to speak, share about our ministry, see old friends and make new ones. If you are in the Southern California area on any of these days, we would love to have you join us. * PLEASE PRAY that we might be an encouragement and blessing to the churches we visit as we communicate what God is doing in Japan. * PLEASE PRAY for strength, safety and good health as we maintain a rather hectic schedule. * PLEASE PRAY that we might find a little time to rest and spend some fun time together as a family. Well, that’s it for now. We look forward to seeing many of you this summer. Until then, thanks again for all of your prayers and support!